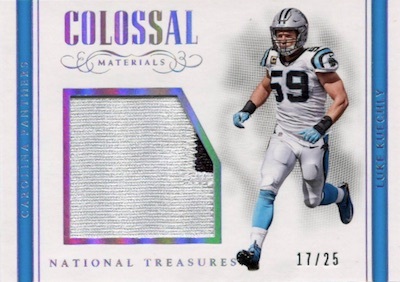 Generally one of the final releases of the hobby season, 2017 Panini National Treasures Football puts a bow on 2017 collecting with some of the most popular rookie cards for high-end collectors, and a whole lot more. The 2017 Panini National Treasures NFL boxes include an average of three autographs and three memorabilia cards. The other two cards in each eight-card box are base cards or base parallels limited to 99 copies or less. This is the same output as the 2016 product. At this price point, the 2017 Panini National Treasures Football checklist is obviously dominated by hits. Taking much of the focus are the Rookie Patch Autograph options for first-year stars. 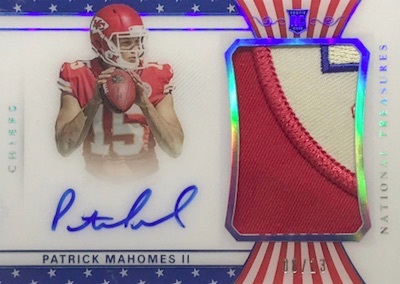 Signed on-card with a jumbo relic, the RPAs are limited to 99 copies with additional Brand Logo, Jersey Number, NFL Shield (1/1) and Team Logo parallels. Numbered to 25, The Future is a new addition, focusing on rising stars and signed acetate. Checking in at 99 or less, the Rookie Jumbo Prime Signatures booklet cards feature an oversized swatch, plus there are Vertical versions. Also limited to 25 copies, the hard-signed NFL Greatest Signatures is reserved for the biggest names from the history of the league. The impressive set first emerged in 2012 NT. Other returning sets include Gridiron Graphs booklets. Collectors can look forward to auto relics for top names in Colossal Signatures and Material Treasures Signatures. More choices are available with Jumbo Patch Autograph booklets. Multi-signed cards are plentiful in 2017 Panini National Treasures Football, as well. Synced Signatures (#/25 or less) utilizes dual on-card signatures and acetate for 20 pairings. Going even further are booklets like the eight-player and 12-player Treasured Signatures and Treasure Chest Signatures. Expected to fill half the hits in each box of 2017 Panini National Treasures Football, relic choices offer many quality options. Perhaps most impressive is the one-of-one NFL Shields Dual. Other memorabilia inserts include Captain's Patches, Pro Bowl Jerseys, Dual Brand Logos, Jumbo Team Logos, Nike Brand Logos and NFL Shields. Shop 2017 National Treasures NFL autographs on eBay. PARALLEL CARDS: Jersey Number Red (#/99 or less), Purple #/75, Gold #/49, Silver #/25, Holo Gold #/10, Emerald #/5, Platinum 1/1, Printing Plates 1/1. 58 cards. Serial numbered #/99. PARALLEL CARDS: Jersey Number Red #/96 or less, Gold #/49, Holo Silver #/25, Holo Gold #/10, Emerald #/5, Platinum 1/1, Printing Plates 1/1. All subjects not found in each parallel. See the spreadsheet for full parallel details. PARALLEL CARDS: Green Jersey Number #/88 or less, Holo Silver #/25, Stars and Stripes #/13 (FOTL - No Switzer), Holo Gold #/10, Black #/5, Red #/2, Red Brand Logo #/2, Red Laundry Tag #/2, Platinum NFL Shield 1/1, Printing Plates 1/1. PARALLEL CARDS: Holo Silver #/25, Holo Gold #/10, Black #/5, Blue NFL Shield 1/1, Printing Plates 1/1. PARALLEL CARDS: Gold #/25, Holo Silver #/15, Holo Gold #/10, Emerald #/5, Platinum 1/1, Printing Plates 1/1. PARALLEL CARDS: Gold #/25, Holo Silver #/10, Black #/5, Platinum 1/1, Printing Plates 1/1. PARALLEL CARDS: Prime #/25 or less, Brand Logo Tag 1/1, NFLPA Tag 1/1, NFL Shield Tag 1/1, Printing Plates 1/1. All subjects not found in Tag parallels. See the spreadsheet for full parallel details. PARALLEL CARDS: Numbers Green #/88 or less, Holo Silver #/25, Holo Gold #/10, Black #/5, Brand Logo Red #/2, Laundry Tag Red 1/1, NFL Shield Red 1/1. Blue 1/1, Printing Plates 1/1. 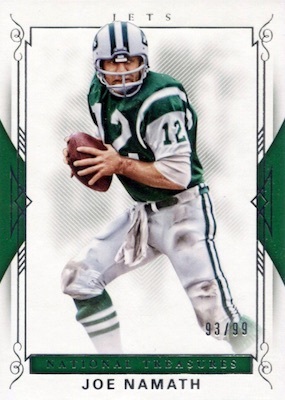 PARALLEL CARDS: Prime #/49 or less, Holo Silver #/25 or less, Holo Gold #/10 or less, Emerald #/5 (Suggs #/4*), Platinum 1/1, Printing Plates 1/1. 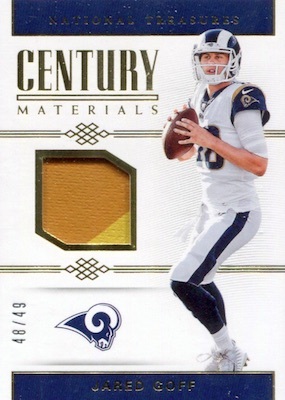 PARALLEL CARDS: Prime #/25 or less, Prime Holo Gold #/10 or less, Brand Logo 1/1, Laundry Tag 1/1, NFL Shield 1/1. PARALLEL CARDS: Prime #/25 or less, Prime Holo Gold #/10 or less, Team Logo #/8, Brand Logo 1/1, Laundry Tag 1/1, NFL Shield 1/1, Trophy Logo 1/1. PARALLEL CARDS: Prime #/25 or less, Brand Logo 1/1, Laundry Tag 1/1, NFL Shield 1/1, Printing Plates 1/1. PARALLEL CARDS: Prime #/25, Laundry Tag #/5, Brand Logo #/2, NFL Shield 1/1. PARALLEL CARDS: Prime #/25 or less, Prime Holo Gold #/10 or less, Laundry Tag 1/1. PARALLEL CARDS: Prime #/25 or less, Holo Gold #/10 or less, Laundry Tag 1/1 (No card #15*). PARALLEL CARDS: Prime #/25, Holo Gold #/10, Brand Logo Tag 1/1, NFLPA Tag 1/1, NFL Shield Tag 1/1. 38 cards. Serial numbered #/25. PARALLEL CARDS: Gold #/10 or #/5, Holo Silver #/5 or #/3, Platinum 1/1. PARALLEL CARDS: Jersey Number Red (#/88 or less), Gold #/49, Holo Silver #/25, Holo Gold #/10, Emerald #/5, Platinum 1/1, Printing Plates 1/1. 28 cards. Serial numbered #/25. PARALLEL CARDS: Team Logo #/10 (Mixon #/7), Brand Logo 1/1, NFL Shield 1/1. All subjects not found in shield/logo parallel. See the spreadsheet for full parallel details. PARALLEL CARDS: Laundry Tag #/5 (Switzer 1/1*), Brand Logo #/2, NFL Shield 1/1. VERTICAL PARALLELS: Vertical #/99 (Swtizer #/49), Nameplate #/13 or less, Laundry Tag #/5 (Switzer 1/1*), Brand Logo #/2, NFL Shield 1/1. 28 cards. Serial numbered 1/1. VERSIONS: NFLPA 1/1, NFL Shield 1/1, Swoosh 1/1. 3 cards. Serial numbered #/49. PARALLEL CARDS: Prime #/25, Brand Logo 1/1, Laundry Tag 1/1, NFL Shield 1/1. 4 cards. Serial numbered #/49. PARALLEL CARDS: Prime #/25, Tags 1/1. 2 cards. Serial numbered #/5. 22 cards. Serial numbered #/25. PARALLEL CARDS: Team Logo #/5 or less, Brand Logo #/2, Laundry Tag 1/1 (No Evans*), NFL Shield 1/1 (No Bryant*). All subjects not found in Team Logo parallel. See the spreadsheet for full parallel details. PARALLEL CARDS: Prime #/10 (Curtis Martin #/5), NFL Shield 1/1. Brand Logo 1/1 (Only Favre/Rice). All subjects not found in NFL Shield parallel. See the spreadsheet for full parallel details. 60 cards. Serial numbered #/49. PARALLEL CARDS: Prime #/25 (Kiesel #/20), Brand Logo 1/1, Laundry Tag 1/1, NFL Shield 1/1. PARALLEL CARDS: Prime #/25, Brand Logo #/2, Laundry Tag 1/1, NFL Shield 1/1. View the 2017 National Treasures Football checklist spreadsheet. I remember when Panini did Timeless Treasures. It was around $100.00 per tin. Football cards shouldn’t cost people $400.00 – $500.00 per box. Panini is drowning the market with this stuff. My Ben Simmons RC collection has five cards with the same picture. A couple of his second year cards have those same pictures. Panini is worse the UD was. It’s National Treasures Football!! Nothing but 5 stars!! Jeremy – you are so spot on. Having one brand make all the products has completely ruined collecting for me. They use the same pictures, same 5 players for each team, zero creativity, I’m really hoping Topps starts making nfl cards again. 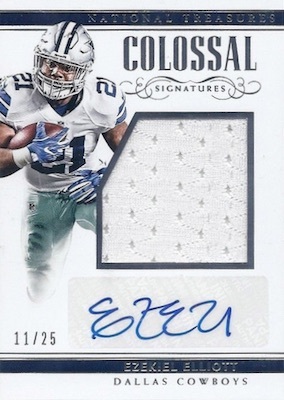 Sticker autos…single color patches…more 1 of 1 tags from jerseys barely touched by players. Plates and Patches is 5 times less and you can get the same patch cards with the same sticker autos and same pictures. For $200 less I can buy Immaculate and maybe get a cleat or chin strap mem card. The consumer is basically paying for the card stock and the tin. What’s the value? Like the guy above stated, Plated and Patches are made with similar quality card stock but full bleed photos. Treasures babseball is ok because of the rich history tied to it, but NT Football never holds value. Worthless ‘base’ cards. Jim Plunkett autos. Jack Young blood autos. Rookie stickers a year after they have been in the league. If it wasn’t for the breaker culture of “chasing logoman” and “nfl shields” this would be a bust. Spectra is beautiful and cheaper. Immaculate is virtually the same and cheaper. Sidenote…whatever happened to dirty patches. All this game used material out here and I rarely see dirty patches. Last year I pulled more dirty game used patches out of Unaralelled than I did in Treasures. I guess we can’t have it all. 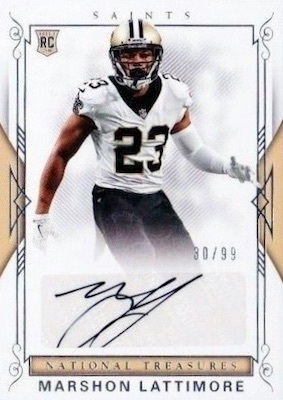 HITS Memorabilia products are starting to look better than NT. RickyJones hit the nail on the head. This years product is NOT NT its Immaculate with the NT price tag. Sad because NT used to be amazing and something you look forward to, but when the shield hits are “PLAYER WORN”, and cheap Gloves, Hats and other strange inserts are big hits it really kills the desire for NT. Save your money get Encased with the exact same hits at least those are graded. Cards priced this high should not have sticker autographs, super disappointing. Forget about buying a box or even getting in any team breaks; I’ll salvage what I can off eBay. Nice product, but way overpriced. You can purchase Plates & Patches for a fraction of the cost and get the same type of patches and sticker autos. 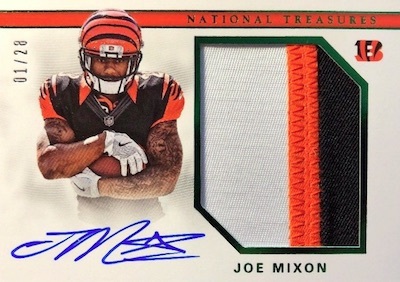 Panini overloads with “event/player worn” material and you can get that even in retail boxes. If you’re forking out a mortgage payment, I’d expect something game worn or better quality. You’re better off buying Immaculate, Spectra, or better yet buy a couple P&P and you’ll get the same type of cards, with even better photos.